Amy Jo was named the third most powerful woman on Twitter by Forbes. Author of New York Times best-seller Renegades Write the Rules, founded Digital Royalty in 2009 to help corporations, celebrities and sports entities humanize their brands online through social communication channels. Amy Jo has worked closely with world-renowned brands such as Hilton Worldwide, Dwayne "The Rock" Johnson and Shaquille O'Neal to successfully humanize their presence. Her motto: humans connect with humans, not logos. Subscribe now to get early access to exclusive bonuses for my upcoming book, Renegade, when it launches. Get your very own Paperback copy of "Renegade: Amy Jo Martin." Get your very own Paperback copy of "Renegade: Amy Jo Martin," plus a special donation will be made to charity : water on your behalf. Get your very own Paperback copy of "Renegade: Amy Jo Martin," plus one for your friend. Get 125 Paperback copies of "Renegade: Amy Jo Martin." Get 250 Paperback copies of "Renegade: Amy Jo Martin," plus a Keynote on the future of technology, humanity and female entrepreneurship. 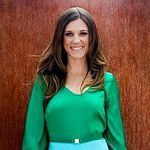 As a young female building her career in male-centric industries, Amy Jo has developed a passion for helping women thrive in business leadership. In this book, Amy Jo not only explores the relationship between technology and humanity, she also chronicles her experience growing her business in ten different countries and describes why investing in female leadership is smart.